The typical air wing aboard a U.S. Navy aircraft carrier usually contains three FA-18 squadrons, one S-3 squadron, one EA-6B squadron, one E-2C squadron, and one helicopter squadron. You can find detailed information on each of these aircraft by clicking on the silhouette. That will take you to the Navy Fact File for that particular aircraft. 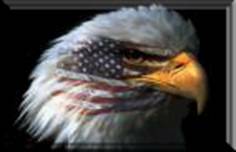 In October 1985, TOPGUN became an Echelon II Shore Command reporting directly to the Chief of Naval Operations. “USS Boxer (CVS-21) transited the Panama Canal and entered the Caribbean Sea on 24 October 1958, last aircraft carrier to transit the Panama Canal” (Ref. 843). “On 1 November 1958, USS Boxer (CVS-21), former CVA-21 & CV arrived Norfolk, Va., with Captain Irvin L. Dew, "Ike," USNA '33 (last CO as CVS 21), as Commanding Officer, ending her West Coast transfer via the Panama Canal into the Caribbean Sea, the last Aircraft Carrier to do so, steaming through the Eastern Pacific from Naval Air Station, North Island, San Diego, California. operating with the United States Atlantic Command (Atlantic Fleet) under the direction of the 2nd Fleet, steaming through the Atlantic to Norfolk, Va., reuniting with her former home port, her departure on 17 July 1945, when she departed for San Francisco, California; ending her third deployment as a Anti Submarine Warfare (ASW), operating with the Pacific Fleet and tour with the 7th Fleet. Official Naval historical records show: " Amphibious Squadron Ten was established on 22 October 1958 and consisted of Boxer (Flagship), Plymouth Rock LSD-29, Fort Snelling LSD-30, Speigal Grove LSD-32 and Hermitage LSD-34 . The formation of Phibron Ten marked the Navy's designation of a tactical unit of high speed ships as an amphibious assault force capable of transporting troops, boats and helicopters over long distances and launching an amphibious attack by sea and air. There slogan was "By sea, by air anytime, anywhere." Boxer transited the Panama Canal and entered the Caribbean Sea on 24 October 1958, last aircraft carrier to transit the Panama Canal; making one “WestPac” deployment as a ASW carrier, on her tenth “WestPac” deployment operating with the Pacific Fleet and tour with the 7th Fleet, joining up with CTG 7.3 for Bikini atom bomb test series support on her second ASW deployment; redesignated CVS-21 - antisubmarine warfare aircraft carrier on 1 February 1956; made four Combat and two Peace Keeping Cruises during the Korea Conflict/War; received eight battle stars for her service off Korea; making three “WestPacs” as a CVA; reclassified CVA-21 on 1 October 1952 while under going repairs at San Francisco, Calif.; making six “WestPacs” and one NorPac as a CV. Her 14th Foreign Water Fleet Deployment (FWFD) since her commission 16 April 1945, with Captain D. F. Smith in command (14 October to 1 November 1958)” (Ref. 1-Boxer, 8, 72, 76 & 843). 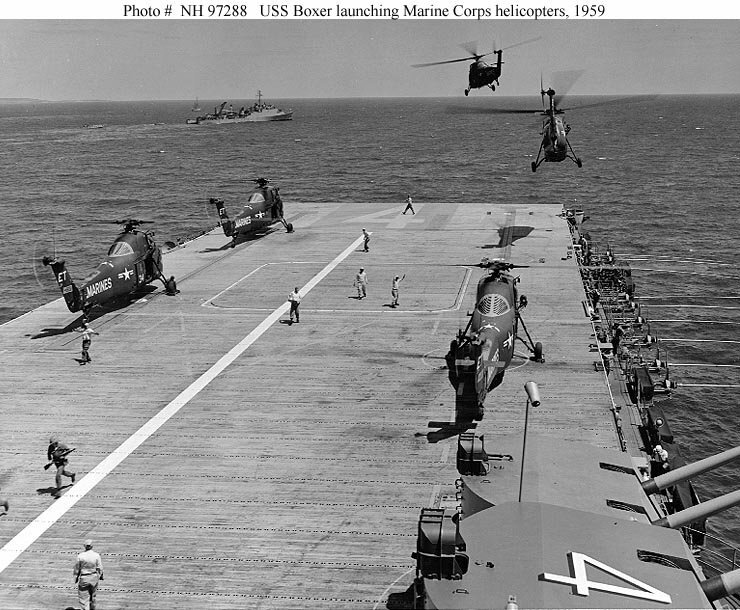 “The first permanent Marine Aviation Detachment of 327 men afloat was activated on board USS Boxer (CVS-21) on 10 November 1958 to provide supply, maintenance, and flight deck control functions necessary to support the Marine helicopter squadrons and troops” (Ref. 1-Boxer & 72). Kenneth Talley has a story. He served and played a major role in the development of the vertical envelopment concept of amphibious warfare and maintaining an over-the-beach assault capability. There are so many stories, that if only the Public Relations Department of the U.S. Navy would honor those who have served aboard U.S. Aircraft Carriers by releasing ship logs, countless books and movies would be the result, creating jobs, after all you got to a have a crew for the movie and a couple training aircraft carriers for movie platforms would create revenue as well. “The fifth Boxer (CVS-21), former CVA-21 & CV, the 21st aircraft carrier of the United States Navy by Hull No. and in order of commission, the 33rd, commissioning on 16 April 1945, Captain D. F. Smith in command, was redesignated as LPH-4, Amphibious Assault Ship on 30 January 1959, under going FRAM rather then SCB SCB modernizations (angled flight deck) during service as CV (FRAM – 31/01/59 to mid June); making one “WestPac” deployment as a ASW carrier, on her tenth “WestPac” deployment operating with the Pacific Fleet and tour with the 7th Fleet, joining up with CTG 7.3 for Bikini atom bomb test series support on her second deployment, making her transfer to Norfolk, Va. on her third ASW Carrier deployment; redesignated CVS-21 - antisubmarine warfare aircraft carrier on 1 February 1956; made four Combat and two Peace Keeping Cruises during the Korea Conflict/War; received eight battle stars for her service off Korea; making three “WestPacs” as a CVA; reclassified CVA-21 on 1 October 1952 while under going repairs at San Francisco, Calif.; making six “WestPacs” and one NorPac as a CV; launched on 14 December 1944 by Newport News Shipbuilding and Dry Dock Co. Newport News, Virginia, sponsored by Ruth D. Overton (daughter of John H. Overton, Senator from Louisiana); keel was laid down on 13 September 1943 at the Newport News Shipbuilding and Dry Dock Co. Newport News, Virginia and was a United States Navy Ticonderoga-class aircraft carrier. Named: Captured British ship in 1813 by USS ENTERPRISE” (Ref. 1-Boxer, 72, 76 & 843). USS Boxer (LPH-4) underway, date and location unknown. “USS Boxer (LPH-4) remained with Phibron Ten and played a major role in the development of the vertical envelopment concept of amphibious warfare and maintaining an over-the-beach assault capability. Phibron Ten operated regularly throughout the Caribbean Sea, called at Puerto Rico, the Virgin Islands, Haiti, Jamaica, Dominican Republic and Guantanamo Bay. On occasion the Uss Rankin AKA-130 and Desoto County LST 1171 operated with Phibron Ten” (Ref. 843). 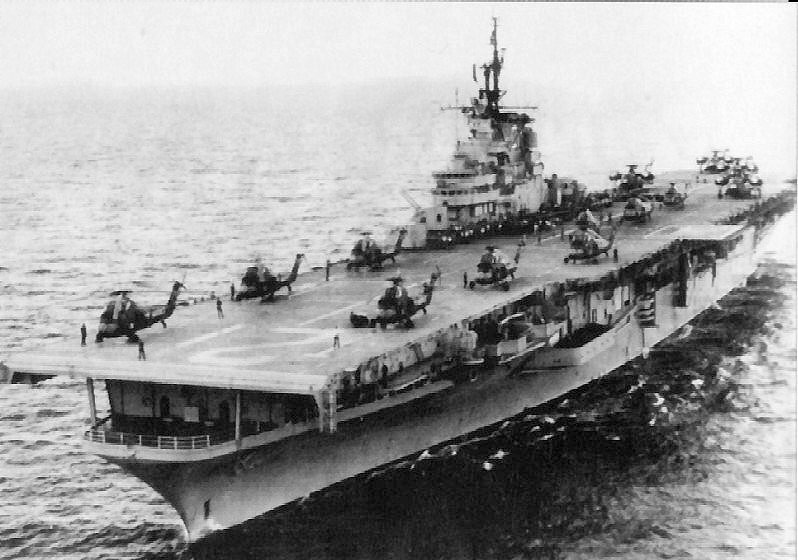 USS Boxer (LPH-4) underway with assault helicopters ranged on deck, apparently HUS Seahorses forward and HR2S Deuces aft, circa January-February 1959, probably off the coast of Cuba. Embarked units included 3rd Battalion, 8th Marines. Original Caption from AP Wire Service "WILL PUT IN AT GUANTANAMO, CUBA -- This is the USS Boxer which the U.S. Navy said today will put in at Guantanamo, Cuba, this weekend. About 1,500 Marines taking part in an amphibious group training in the Caribbean, will go ashore for rest and recreation. A spokesman said that the shore leave had been scheduled for several months. (U.S. Navy Photo via APWire photo." Presented by Robert Hurst. Marine Corps HUS-1 helicopters lift off form USS Boxer (LPH-4)'s flight deck, during operations off Vieques Island with the Tenth Provisional Marine Brigade, 8 March 1959. Photograph by Grantham. US Navy photo # NH 97288. US Naval Historical Center. Helicopters used by the 327 Marine Ship Company flight deck crew of V-1 Division included HR2S or later H37 heavy helicopters and light HUS. “USS Constellation (CVA-64) (Connie) with CVG-5 embarked departed Mayport, Fl. 25 July 1962, with Captain Thomas J. Walker, USN, as Commanding Officer, on her first Vietnam Expeditionary Force (VEF) deployment in the Caribbean Sea near Cuba, on her two-month trip and home port transfer operating with the United States Atlantic Command under the direction of the 2nd Fleet, steaming in the Western and Southern Atlantic via Mayport, Fla., where she will embark some squadrons from CVG-5 steaming around Cape Horn in the Southern and Eastern Pacific and to her new home port of Naval Air Station, North Island (NASNI), San Diego, California operating with the Pacific Fleet and Seventh Fleet. She will under go her second Foreign Water Fleet Deployment (FWFD) since her commission at New York Naval Shipyard on 27 October 1961, with Captain T.J. Walker in command” (Ref. 1-Constellation, 72 & 76). *CVA-64 and CVA-16 embarked CVG-5 in 1962 at the same time. Only some squadrons from CVG-5 were aboard CVA-64 and CVA-16. “USS Constellation (CVA-64) made afuel stop at Spaing, Trinid on 30 July 1962” (Ref. 1346). “USS Constellation (CVA-64) crossed the line and conducted Shell Back Initation on 4 August 1962 and the crew was organized by a group of 320 sadists, butchers, and criminals known as has Shellbacks, duly certified by Bupers and Epdolant, the initation cermonies were thoroughly designed, and excuted by small groups of the Trusty 320, as decreed by the Royal Court of Neptunis Rex July 1962” (Ref. 1347). “USS Constellation (CVA-64) made a port of call at Rio De Janeiro from 9 to 13 August 1962” (Ref. 1348). “USS Constellation (CVA-64) made a port of call at Valparaiso, Chile from 24 to 27 August 1962” (Ref. 1349). “USS Constellation (CVA-64) received a radio message that the Israeli freighter Velos needed assistance and on the afternoon of 2 September 1962, Constellation met the Velos. A signalman on the 010 level spotted the international flag of distress “Urgently require medical assistance.” In seconds the ships were in voice radio contact, airmen were at flight quarters, and a helo was in the air. Minutes later, the “Angel” returned to lower a badly injurd seaman to the waiting arms of corpsmen and strectcher bearers, who carried him to Sick Bay for treatment and further transfer to a hospital ashore. The mercy mission accomplished, the two ships set their separate courses; Constellation resumed her heading to Balboa” (Ref. 1350). “USS Constellation (CVA-64) pulled in for a port of call at Balboa on 3 September 1962, passing under the Thatcher Ferry Bridge in Balboa, Panama, while she was en route from New York to San Diego (NASNI) on her first trip ‘round the Horn” (Ref. 1351). The photograph was erroneously labeled by the Navy as being Ranger (CVA/CV-61) when it is in-fact Constellation (CVA/CV-64). The most obvious issue is the arrangement of the STBD side, Deck Edge Elevators. In the photo there are two elevators forward of the island, as where Ranger had only one forward. Next; the STBD, FWD Sponson on Ranger originally had a pair of 5” MK42 guns and therefore a rather distinct shape, neither of which exist in the photo. Also, the presence of a lattice radar mast abaft of the island which was not mounted on carriers until the Kitty Hawk Class. A second photo showing the vessel docked near the bridge. Naval History & Heritage Command has removed the image from its website” (Ref. ABH Jeffrey Saupp – 253-797-9934 - jsaupp@hotmail.com, notified on 11 May 2017). “USS Constellation (CVA-64) made a port of call at Balboa from 3 to 6 September 1962” (Ref. 1351). “USS Constellation (CVA-64) made a port of call at Acapulco, Mexico from 10 to 13 September 1962” (Ref. 1352). “On 17 September 1962, USS Constellation (CVA-64) (Connie) with CVG-5 embarked arrived Naval Air Station, North Island (NASNI), San Diego, California, with Captain Thomas J. Walker, USN, as Commanding Officer, ending on her first Vietnam Expeditionary Force (VEF) deployment in the Caribbean Sea near Cuba, on her two-month trip operating with the United States Atlantic Command under the direction of the 2nd Fleet, steaming from Norfolk, Va. in the Western and Southern Atlantic, arriving Mayport, Fla., where she embarked some squadrons from CVG-5, departing 25 July 1962, steaming around Cape Horn through the Southern and Eastern Pacific and to her new. Constellation made afuel stop at Spaing, Trinid on 30 July 1962. Constellation crossed the line and conducted Shell Back Initation on 4 August 1962 and the crew was organized by a group of 320 sadists, butchers, and criminals known as has Shellbacks, duly certified by Bupers and Epdolant, the initation cermonies were thoroughly designed, and excuted by small groups of the Trusty 320, as decreed by the Royal Court of Neptunis Rex July 1962. Constellation made a port of call at Rio De Janeiro from 9 to 13 August 1962. Constellation made a port of call at Valparaiso, Chile from 24 to 27 August 1962. Constellation received a rado message that the Israeil freighter Velos needed assistance and on the afternoon of 2 September 1962, Constellation met the Velos. A signalman on the 010 level spottedd the international flag of distress “Urgently require medical assistance.” In seconds the ships were in voice radio contact, airmen were at flight quarters, and a helo was in the air. Minutes later, the “Angel” returned to lower a badly injurd seaman to the waiting arms of corpsmen and strectcher bearers, who carried him to Sick Bay for treatment and further transfer to a hospital ashore. The mercy mission accomplished, the two ships set their separate courses; Constellation resumed her heading to Balboa. Constellation made a port of call at Balboa from 3 to 6 September 1962. Constellation made a port of call at Acapulco, Mexico from10 to 13 September 1962. Ports of call include: Spaing, Trinid; Rio De Janeiro; Valparaiso, Chile; Balboa and Acapulco, Mexico. Squadrons: VF-51, YF8U-2NE (YF-8E); VA-56, A4D-2 (A-4B); VA-55, A4D-2N (A-4C); VAH-10 Det. B., A3D-2 (A-3B); VFP-63 Det. B., F8U-1P (RF-8A) and HU-2 Det. 64, HUP-2 (UH-25B). Her second Foreign Water Fleet Deployment (FWFD) since her commission at New York Naval Shipyard on 27 October 1961, with Captain T.J. Walker in command (25 July to 17 September 1962)” (Ref. 1-Constellation, 72, 76, 1098, Constellation (CVA-64) made afuel stop at Spaing, Trinid on 30 July 1962” (Ref. 1346, 1347, 1348, 1349, 1350, 1351, 1352). “Captain Stanley W. Vejtasa, USN assumed command during a change of command ceremony aboard USS Constellation (CV-64), relieving Captain Thomas J. Walker, USN, 1st Commanding Officer, serving from October 1961 to November 1962” (Ref. 406A).